It's been a few weeks since GRL, and already I'm counting the days until the next one. I'm taking a list next time, to be sure I get all the books I want. I'll be able to load down my car! No airlines fees! In addition to my book list, I need to also make a list of attendees that I want to see. This year there were so many people that I missed a few. I plan to stay a full week in Atlanta, and hopefully that'll give me more time to mingle. I also hope to have a better camera by then. Did I mention that I love people? Anyway, in my last GRL post I mentioned some of the great authors I met. Today I'd like to focus on the readers. I've posted this separately because I want to say a big thank you to readers, for without them, where would we authors be? They read, comment, tell their friends, and provide excellent feedback and suggestions. Being a relatively new author, I'm still amazed when someone says "I read your book", 'cause I've not completely wrapped my mind around the fact that I even write books. And to hear someone say, "I loved your book?" Mind-boggling, in a good way. But there are some readers that I've met on Goodreads and other places that stand out in my mind, and I was very happy to see them at GRL! 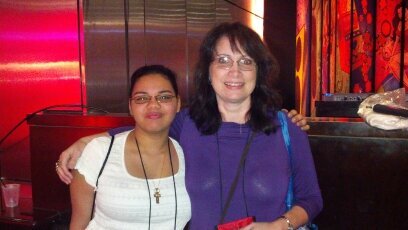 Me with Heather C! 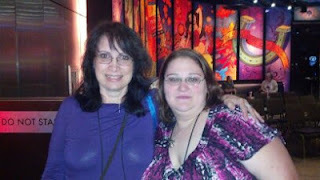 Heather C was among the first readers to comment on my work way back three years ago when I first started publishing. Gee! Has it been that long? Me with Nikyta, another reader who chimed in early! I think I scared the poor lady at last year's GRL. I saw her nametag and leapt over my book signing table to greet her. It's so great to meet folks you know online in the real world. 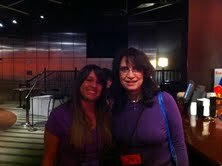 I don't recall this lady's name, but she was the sweetest thing! We danced together! Of course, I think I danced with half the people who attended. I didn't realize how much I loved to dance! I knew H.A. Caine first as a reader, and now she's made the leap into writing. It's so wonderful to see a new author's publishing dreams coming true. I'm quite sure Pam got a pic of us, but it wasn't on my camera! I still need to get a copy of hers. So many more faces I want to remember always! Yes, sigh. It was over way too quick. Next year, we'll be in my neck of the woods, sort of.